Enugu Rangers striker, Chisom Egbuchulam has voiced his sentiments following his match-winning performance against Rivers United in the second game of the annual pre-season tournament of the Nigeria Professional Football League (NPFL), the Super 4 on Wednesday. Egbuchulam netted a spectacular second half brace to put United to the sword at a frenzied Nnamdi Azikiwe Stadium, Enugu. The attacker took the time to reflect on a very good day in the office in an exclusive chat with the Rivers United official website, www.riversunitedfc.com.ng. “It was a great game and we got a deserved three points. “It wasn’t an easy game but we thank God for the victory and I am also pleased with the goals I scored,” he said. Rangers outclassed United 4-0 in their previous meeting at the same venue on September 4 but struggled for long periods, especially in the first half against the Port Harcourt club on Wednesday. Egbuchulam identified improvements in the United side that fell 0-2 at the Cathedral on Wednesday, noting that the new players drafted in by Stanley Eguma has made the Port Harcourt club look a more decent proposition. “They are a good side. They played very well in the first half but were unable to score. “They can give Nigeria good representation on the continent. “There are a lot of changes in the present Rivers United team. “They have a lot of new players who are very good as well. “This is a much better Rivers United team,” he said. Enugu Rangers coach, Imama Amapakabo is full of praise for Rivers United despite masterminding a 2-0 defeat of the Port Harcourt club in the Nigeria Professional Football League (NPFL) Super 4 on Wednesday. Chisom Egbuchulam’s stunning second half double at the Nnamdi Azikiwe Stadium, Enugu put the ‘Pride of Rivers’ to the sword as the ‘Flying Antelopes’ hit the ground running in Nigeria’s biggest pre-season tournament. Amapakabo noticed improvements in the United team and tips them to achieve positive things in the future. “Rivers United have some very very good players that they have been able to add into their team and they are beginning to stand up and be counted. “About three of my players were not finding their feet in the first half so I knew I had to effect the substitutions I did (that) in the second half for things to happen for us. 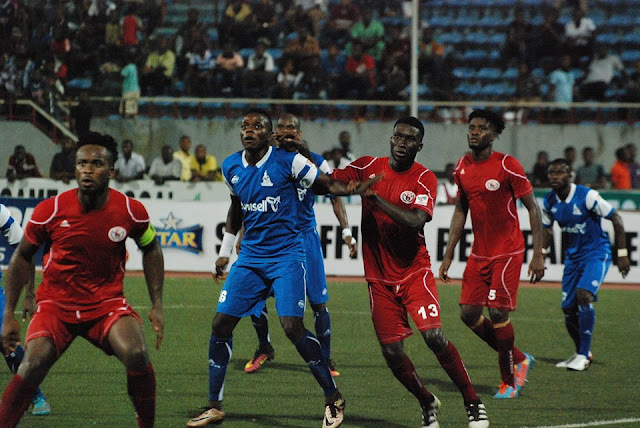 “We came with a different game plan but Rivers United surprised us with their tactics. “I was expecting (Rivers United technical manager, Stanley Eguma) to play with three attackers, spread out wide but he played two strikers with (Nzube) Anaezemba playing out wide and coming into the centre. “We noticed that, reorganized our play and it paid off for us,” he told www.riversunitedfc.com.ng. Amapakabo also had words of praise for the vanquished United team which he described as “a very good side that can hold on to the ball and play”. “This is a better team compared to the side of last season. This is a very good side that can hold on to the ball and play. “They however do too much of that (keep possession) in their own half of the pitch but I am sure the coach will correct that as the days go by. “They need to play a lot more of through passes with their attackers making a lot of runs (off the ball) and they will get it right. “On Wednesday, I saw a (Rivers United) side with so much confidence and they always want to play which is not a good thing,” he said. Meanwhile, Eguma was still in bullish mood after the reverse on Wednesday especially after seeing his side play so well early on. The experienced gaffer praised his players for the effort and identified isolated individual and collective mistakes for the loss to the ‘Flying Antelopes’. “The goals they scored were against the run of play which were as a result of some defensive blunders we committed. “Generally, my team did not disappoint but we will get better. “Don’t forget too that Rangers played basically, the same team from last season while we are still trying to build a new team and that gave them a little edge over us. “We lost concentration in some moments in the second half and also failed to score from some very good chances we created,” he said. Rangers will next meet Wikki Tourists in a top-of-table clash on Friday by 5pm with United kicking off their next game of the tournament against FC Ifeanyiubah by 7pm. Both games will be played at ‘the Cathedral’, the Nnamdi Azikiwe Stadium, Enugu.